The AIDS Assistance Program’s 22nd annual Evening Under the Stars — voted as one of the best fundraising events in the Coachella Valley — certainly fulfilled the expectations of the 1,200 guests and volunteers who gathered on the greens at O’Donnell Golf Club for an electric night of entertainment. Attendees were decked out in a variety of fashion wear from laid-back desert casual to black tie formal and everything else in between including funky pants and jackets designed in paisley or plaid prints; Cary Grant-style white dinner jackets; and, of course, the fun and outlandish costumes. People watching was at its best beside the photo booths where it was all recorded. 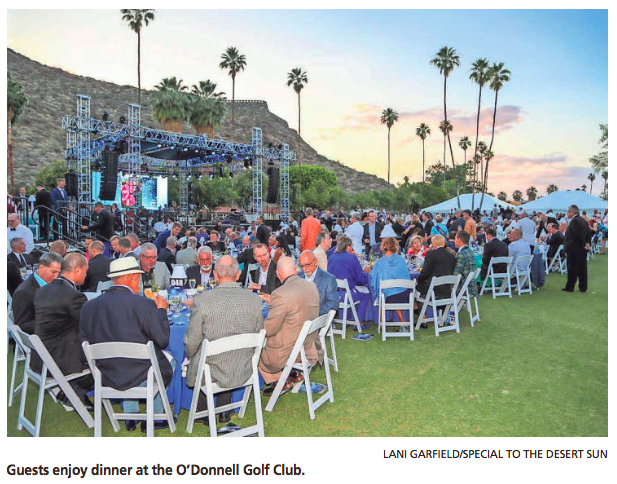 Even before the program started there was a spectacular silent auction, a chance to win a new Audi A3 Cabriolet from Audi Rancho Mirage, and a lively pre-dinner performance by Blue Note Orchestra. Helene Galen and Jan Salta, who were sitting next to each other, both won dinners with Lily Tomlin for $9,000 each during the live auction. Lynne and Brad Toles and their amazing crew from Savoury’s did a herculean job of serving nicely prepared hot food, including delicious short ribs and vegetarian plates (out of a tent! ), to more than a 1,000 diners. A video on AAP revealed that any one-year resident of the greater Palm Springs area, living in poverty and diagnosed with HIV/ AIDS, is qualified to receive AAP food vouchers. The goal is to help them live their lives with dignity and self-respect. All charitable donations have dwindled in recent years, so AAP is on a constant quest to fund their programs through innovative events like Evening Under the Stars, which has generated up to $250,000 in years past. Auctioneer Jeff Tannenbaum, Mary Wilson of the Supremes, and Bella da Ball showed the audience how to use their cellphones to text in their donations during the live bidding for pledges. Entertainer Barry Manilow, contributed $10,000 via text from his table. Master of ceremonies, Mark Walberg (not to be confused with the “other” Mark Walhberg, actor) used his background as a veteran of the entertainment industry and current star of PBS’s highly rated “Antiques Roadshow” to keep the busy program moving along. CEO and Executive Director of AAP Mark Anton thanked major sponsors Eisenhower Medical Center and Contour Dermatology, the presenting sponsor Audi Rancho Mirage, and presenting media sponsor, The Desert Sun. An additional media sponsor was Palm Springs Life. Other top sponsors were The Auen Foundation, James R. Houston, Harold Matzner, Donna MacMillan, Barbara and Jerry Keller, The Wade Endowment Fund, Tony Marchese and Mark Van Laanen,Stiletto Entertainment, Helene Galen and Jamie Kabler, Dimitri Bakakos, Curtis Barber and Timothy Carlson, Lynn Hammond, Robert Owens, John Federbusch and Gary Frey, Scott Histed and Mark Anton, Glenn Johnson and Michael Melancon, plus dozens of others including AAP Bronze, Silver & Gold Angels. Jean-Guy Lachance and Mike Lang were thanked for their tireless dedication and support with the administration of AAP and the food voucher program. Also thanked was Anton’s longtime partner, Scott Histed, for his patience, love and support. Next came presentations to four honorees, where two of the desert’s most popular female media icons were feted. The Jeannette Rockefeller Humanitarian Award was presented to The Desert Sun’s feisty, smart and funny Betty Francis, who has been with the paper since 1996, and is currently the tireless society news director and champion of nonprofits. Greg Burton, The Desert Sun’s executive editor, introduced Betty as a strong woman embodying the culture and spirit of giving in this valley. John Williams and Richard DeSantis both received the Herb Lazenby Community Service Award for their outstanding commitment to services within the desert community. Williams has been board president of the Mizell Senior Centers for four years while also dedicating time and talent to other non-profits. Richard DeSantis, show producer of this event and hundreds of other high-profile productions, credited his outstanding team of professionals for creating so many memorable charity events which have raised millions to improve the lives of others. The now wired up ready to party audience was treated to AAP’s featured entertainer Darlene Love who, since the early ’60s, has been a consonant performer with famous groups and individuals such as the Blossoms, The Crystals, The Righteous Brother, Dione Warwick, Marvin Gaye and Elvis Presley to name a few. She performed many of her songs including “He’s a Rebel,” “Wait Til my Bobby Gets Home” and “He’s Sure the Boy I Love.” She had a sea of eager dancers rocking out to her billboard hits. After Love completed her show, the high-energy band Nightshift took the stage so the still ready-to-party pumped up guests could continue their dance marathon until the event ended close to midnight. Spotted on the scene were Harriet Baron, Carol Channing, Michael Childers, Tom Jakway and Steve Tripp, Terri and Bart Ketover, Catharine Reed with son Sandy Reed, Lori and Aubrey Serfling, Martin Massiello, Rabbi Sally Olins, Joanne Davis, Dr. Timothy Jochen and Lee Irwin, Bettie Callies, Peggy Cravens, Paul Golden, Halston Hair, and Reid and Tristan Milanovich.